The UN General Assembly chose January 27 as the official day for the commemoration, as it was on this day in 1945 that Soviet troops liberated the Auschwitz concentration camp. Throughout Europe, tributes will be paid to the 53 million people who died during World War II, of whom 31 million were civilians. Commemoration has linked usually also to International Holocaust Remembrance Day. The background is, that on January 27, 1945, Soviet troops entered the Auschwitz-Birkenau extermination camp, the last such camp still functioning. They found 7,000 survivors from among the more than 1,000,000 people murdered there. The memory of the Holocaust in western Europe has historically been a kind of spur for ‘anti-racist’ movements, but how to define Holocaust? Most scholars define the Holocaust as a genocide of European Jewry alone, or what the Nazis called the “Final Solution of the Jewish Question”. Taking into account all the victims of Nazi persecution, the total number of victims would be between nine and 11 million of which figure appr. six million were Jews. Earlier the word holocaust has been used since the 18th century to refer to the violent deaths of a large number of people, e.g. many writers used it before World War II to describe the Armenian Genocide of WWI. If and when the word holocaust is reserved to describe murdering six million Jews during WWII the other similar brutalities need another term and the word Genocide is most used to describe the deliberate and systematic destruction, in whole or in part, of an ethnic, racial, religious, or national group. A word pogrom is used mostly in relation with a form of riot directed against a particular group, whether ethnic, religious, or other, and characterized by the killing and destruction of their homes, businesses, and religious centers. Few people know that 3rd biggest extermination center was Jasenovac. Two reasons maybe explain this: 1st it is located in Croatia and 2nd the main part of victims were Serbs. From total 600,000 murdered ones some 25,000 were Gypsies, some 25,000 Jews and over half a million Serbs. Located in Croatia 62 miles south of Zagreb, Jasenovac was Croatia’s largest concentration and extermination camp. Jasenovac, was a network of several sub-camps, established in August 1941 and dissolved in April 1945. The Nazis gave control of Jasenovac to the puppet Croatian government, which was run by the fascist Ustasa movement. A large number of Ustasa members served in the camp, most notably Miroslav Filipovic-Majstorovic, who was notorious for killing prisoners with his bare hands. The Independent State of Croatia was created and supported by Nazi Germany and Fascist Italy. It thus adopted their racial and political doctrines. Jasenovac had a role in the Nazi “final solution”; it was also used, however, in the ethnic cleansing of Romany and Serbian inhabitants. So during the WWII, Serbs shared the similar fate as Jews at the hands of Nazis. Jasenovac was not the only place where Serbia’s neighbour Croatia ran several concentration camps where Jews, Serbs and Roma have been murdered. Bosnian Muslims and Kosovo Albanians were allies of Hitler as well. In April 1945 the partisan army approached the camp. In an attempt to erase traces of the atrocities, the Ustaša blew up all the installations and killed most of the internees. An escape attempt by the prisoners failed, and only a few survived. It seems that after WWII Croats tried to hide all evidence about brutalities in Jasenovac, all material evidence disappeared as if there had not been any camp in that place. Later – during Tito’s time – the state and the authorities tried to implement “Brotherhood and Unity” motto, with the aim of creating tolerance between the nations and the crime had to be forgotten as soon as possible. So commemoration or International Holocaust Remembrance Day or events and history related to them has recent times been observed with various ways. In Serbia Serbs and Jews held the main commemoration ceremony at the Memorial to the Victims of Genocide in the Second World War at the Old Fairgrounds (Staro Sajmiste) in Belgrade – a place where thousands of them were murdered during WWII. Yearly commemoration is important remainder for fair picture of history. At least one day per year is good to think what ultra nationalism can be at its worst level, what kind of interests, power game, attitudes and hidden motivations are creating possibilities for murdering civil populations or ethnic groups. And to remember that these actions have been continuing also after WWII e.g. in Cambodia, Ruanda and Darfur even today. Different aspects of freedom, wider human rights and civil liberties, democracy, economical, social and other kind of development are hard to implement if the state is failing or already failed. If an outstanding problem occurs, such as food crisis or a devastating hurricane, the world’s weakest states are the most exposed when crisis strikes. In the Failed States Index, FOREIGN POLICY and The Fund for Peace rank the countries where state collapse may be just one disaster away. A state that is failing has several attributes. One of the most common is the loss of physical control of its territory or a monopoly on the legitimate use of force. Other attributes of state failure include the erosion of legitimate authority to make collective decisions, an inability to provide reasonable public services, and the inability to interact with other states as a full member of the international community. The 12 indicators (used in Index/AR) cover a wide range of elements of the risk of state failure, such as extensive corruption and criminal behaviour, inability to collect taxes or otherwise draw on citizen support, large-scale involuntary dislocation of the population, sharp economic decline, group-based inequality, institutionalized persecution or discrimination, severe demographic pressures, brain drain, and environmental decay. States can fail at varying rates through explosion, implosion, erosion, or invasion over different time periods. The rank order of the states is based on the total scores of the 12 indicators. For each indicator, the ratings are placed on a scale of 0 to 10, with 0 being the lowest intensity (most stable) and 10 being the highest intensity (least stable). The total score is the sum of the 12 indicators and is on a scale of 0–120. Countries that have scores lower than 30 are categorized as Most Stable, countries that have scores more than 90 are considered as Critical, the scores between them indicates that a state is In Danger, Borderline or Stable. The numbers above are correlating with columns in Failing State Index table below. This article – and statistics behind it – and my earlier article “Freedom in Balkans” are complementary to each other – same problems are viewed from different perspectives. However in general all rankings which I have quoted are representing more or less anglo-american point of view – its values and research methods. If rankings were made e.g. by some byzantine institute the results could be differ – the viewpoint and tradition for example regarding democracy are not one to one with western views. If these limitations are noted so I anyway think that discussion about findings in different countries could be valuable material for further development. Gas flows, everything ok or…? After three weeks dispute Russian gas is heating European homes. Talks ended agreement, it was even signed, bills are paid, prices fixed, EU monitors are checking implementation and everything seems to be ok next ten years. I would not like to be bird of ill omen but I must state to have serious doubts and fear that on the end of year 2009 the situation is the same as three weeks ago. The price of Russian gas to Ukraine almost doubled in situation of international financial turmoil where inflation in Ukraine has been over 50 % last year, its currency has lost most of its value compared to Euro, steel (one of the main export products) is down and the signs of better future are unseen in near future. Domestic political sphere is in stagnation, everybody is waiting new elections which outcome with great possibility is not bringing any solutions. Same time The Security Service of Ukraine (SBU) has finished pre-judicial investigation and directed to court the criminal case of two activists of association Popular Front Sevastopol-Crimea-Russia, has launched new operations against separatist Rusin movement (Subcarpathian Rusin parliament, Carpathian Ruthenians, Rusins of Carpathian Rus), has prevented recruitment of mujahedeens and is speeding its work on revealing streamsof financing of the extremist radical Muslim organizations. An of course the Russian population in East Ukraine and Crimea is ready to activate if needed. Ukraine is in cross-swell of declining U.S. hegemony and rising Russian sphere of interest and the country itself is divided which direction is the best. One part of playground is the energy policy of EU, but also U.S. and Russia. The latest gas dispute made it clear that Ukraine is not reliable transmitter of Russian gas to Europe. This boosts EU’s Nabucco –plan to new level. The same is true also with Russia’s South Stream, Nord Pipe and plans to increase more Liquefied natural gas (LNG) production and transport facilities. When impleneted – probably until 2015 – the new line(s) are invalidating the significance of Ukraine as transit route of energy. I believe unforeseeable future in social developments so the scenario I described above is not predestined the alternative paths are possible as well. E.g. in next elections Viktor Yanukovich’s the Party of Regions can win or lead ruling alliance in future, reconstruct better relations with Russia and minimize the impact of old parties of Orange revolution. 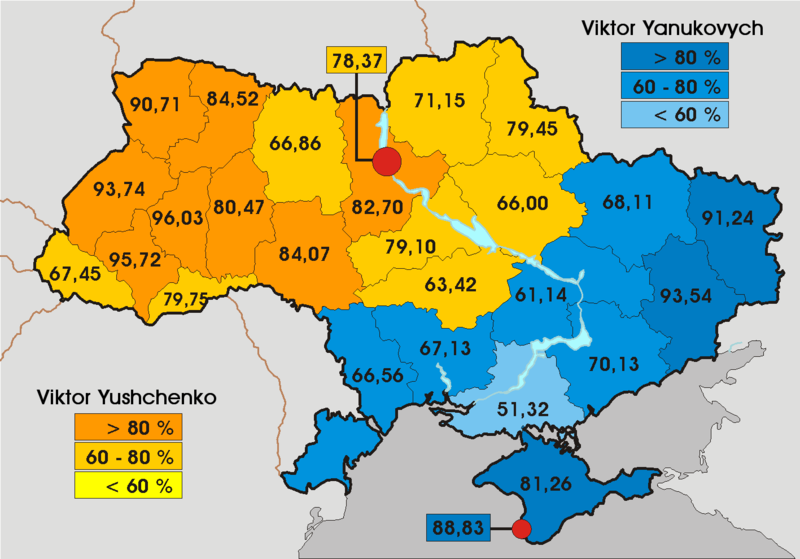 It is also possible that despite results in election separatist movements are gaining more support and one compromise can be creation some kind of federation with strong minority rights which also can block Ukraine’s former western dreams. The Security Information Service (BIS), state intelligence agency of the Czech Republic, have warned members of parliament of the country that gas dispute between Russia and Ukraine most likely will repeat and it is only a matter of time, Prague-based newspaper Pravo reports. Different aspects of freedom are fundamental value of human rights in Balkans as well globally. While starting of a year it’s good time to check the near past and make some benchmarking. Rankings or ratings are one kind of (process) benchmarking in which organizations or in this case states evaluate various aspects of their processes in relation to best practice. In 1st part of my “Freedom in Balkans” serial I make a short update about political rights and civil liberties. In my article “Freedom in Balkans” On September 2008 I wrote about the freedom ratings with political rights, civil liberties, religious and press freedom in Balkans. Now Freedom House released the findings from the latest edition of Freedom in the World 2009, the annual survey of global political rights and civil liberties.The ratings reflect an overall judgment based on survey results and global events from Jan. 1st through Dec. 31st 2008. In my earlier article I had one year older survey. The survey a year ago showed that only Kosovo province (as UN protectorate) fell to category not free;Albania, Macedonia (FRY), Bosnia-Herzegovina and Montenegro were partly free category and Serbia, Romania, Croatia, Bulgaria and Slovenia were in the best free category. Bulgaria’s political rights rating declined from 1 to 2 (1 represents the most free and 7 the least free rating) due to backsliding in the government’s efforts to combat corruption and organized crime, which prompted the European Union to suspend substantial aid payments in July. Macedonia had a downward trend –without number decline – due to increased harassment of and violence against political party members during the country’s June parliamentary elections, which domestic and international observers deemed the worst since independence. So nothing radical happened during last year. The only peculiarity still is the result of Kosovo which is ranked as ‘not free’ and received scores the same as Sudan, Chad and Egypt in terms of political rights and civil liberties despite the fact that international community has been building democratic standards and human rights in its protectorate now over eight years. If the result is this I hope that new EULEX mission will apply some lessons learned in this case. More about methodology and global results from web sites of Freedom House. World Audit Org has been conducting sc. Democracy Audit since 1997.Their survey is concerned only with the criteria of democracy – which they hold to be Human Rights; Political Rights; Free Speech and Absence of Corruption. 150 nations, all those with populations in excess of one million are included. Related to 1st part of my article serial Freedom in Balkans Democracy Audit gives an other point of view to the same topic. World Audit brings together statistics and reports from respected agencies such as Freedom House, Transparency International, Amnesty International, Human Rights Watch and The International Commission of Jurists. From their work and data WorldAudit.Org present and update the World Democracy Audit. With this background it is understandable that the results are quite comparable with those in my earlier articles – Part 1 and its earlier more comprehensive version . In Balkans Slovenia is again on its own top class, Bosnia-Herzegovina is in the last shake of the bag – alone because disputed territories such as Kosovo were not included. The rest of the Balkan countries are between them. Of course one should remember limitations like overvaluation of western perspective with these kind of surveys but anyway from my point of view these survyes are good tools for benchmarking, future planning and debate. Economic freedom is highly valued element especially in U.S. society and its imitators.Conservative politics claims that greater economic freedom generates opportunities for people, creates wealth and respect for human rights.In Nordic countries the approach is different and the economic freedom of one individual – human or company – can be limited if it limits other peoples freedom.However this study is based to traditional American conservative formula and everybody can value the output against that background. The Heritage Foundation is a research and educational institute – a think tank – whose mission is to formulate and promote conservative public policies based on the principles of free enterprise, limited government, individual freedom, traditional American values, and a strong national defence.For over a decade this Washington’s preeminent think tank has tracked economic freedom around the world with its main publication The Index of Economic Freedom. The highest form of economic freedom provides an absolute right of property ownership, fully realized freedoms of movement for labour, capital, and goods, and an absolute absence of coercion or constraint of economic liberty beyond the extent necessary for citizens to protect and maintain liberty itself. In other words, individuals are free to work, produce, consume, and invest in any way they please, and that freedom is both protected by the state and unconstrained by the state. If the Overall score were 100-80 the country was defined to be Free, countries with score 79.9-70 were Mostly free, countries with score 69.9-60 Moderately free, countries with score 59.9-50 Mostly unfree and countries with score between 49.9-0 were defined as Repressed.So according The 2009 Index of Economic FreedomAlbania, Bulgaria, Greece, Macedonia, Romania and Slovenia were Moderately free and the rest of Balkan countries were Mostly unfree. Last autumn I wrote about competitiveness of Balkans referring “ Global Economic Competitiveness Report 2008-2009” of The World Economic Forum, which approaches economic freedom a bit wider angle. Their measures include e.g. health, education, public and private institutions, infrastructure and innovations so perspective is a bit more social than that of hard line conservatives. Anyway in report mentioned Slovenia was ranked as the most competitive economy in the Balkans with rank 42 out of 134 countries polled followed Croatia (61), Greece (67), Romania (68), Bulgaria (76), Serbia (85), Macedonia (89), Bosnia-Herzegovina (107) and Albania (108). If compared the order between economic freedom and competitiveness the biggest difference are ranks of Croatia and Albania – almost opposite positions – so one could say that free economy does not necessary create high competitiveness and mostly unfree economy can sometimes be very competitive. Poverty stricken Bosnian Muslims search a garbage dump near their village of Visca. The extreme winter low temperatures force people who live in poverty to resort to desperate measures to scrape a living. One can dispute which level of economic freedom can increase or decrease common welfare for all population but the fact is that poverty sure limits individuals political and human rights as well use of civil liberties.”Poverty” defined as an economic condition of lacking both money and basic necessities needed to successfully live, such as food, water, education, health care or shelter.The table lists countries by the percentage of the population living below the national poverty line — the poverty line deemed appropriate for a country by its authorities. National estimates are based on population-weighted subgroup estimates from household surveys. Definitions of the poverty line may vary considerably among nations. Thus, the numbers are not strictly comparable among countries. However one could size up that poverty is serious problem in Albania, Bosnia-Herzegovina, Macedonia, Romania and Kosovo province (UNSC 1244 protectorate). This theme is of paramount importance in Balkans. Beginning 1991, political upheavals – such as the breakup of Yugoslavia – displaced millions of people. Officially one part of these people are refugees meaning that they have escaped to other country, one part is “internally displaced persons” (IDPs) meaning that they have escaped from their home village/-town but still are in the same country than before. This kind of restricted moving back to original dwelling place is still – 10-16 years after Balkan Wars – biggest problem in Serbia with 326,853 refugees and IDPs. Bosnia-Herzegovina has 146,586 mostly IDPs, Greece 30,799 (mostly asylum seekers), Montenegro 24,822, Bulgaria 5,848, Croatia 7,826, Slovenia 4,408 (mostly stateless persons), Macedonia (FYR) 2,397, Romania 2,180 and Albania 101 (situation 31st March 2008). (Source UNCHR statistics 3rd June 2008). From this link you can have full-scale of figure above. Limited moving out from home in one’s own country is usually not restricted by law or regulations – the limitations are real or fancied fears in one’s head. In Balkans this problem occurs most in Kosovo province.Albanians in Kosovo’s middle and southern parts are not familiar to travel northern Kosovo, Serbs in their enclaves are afraid to go outside of their enclave. Outside Kosovo this kind of fears are in smaller scale and they maybe occur only when ethnic tensions for some reasons are rising e.g. between Croats and Bosnian Muslims in Bosnia-Herzegovina, between Albanians and Macedonians in Macedonia (FYROM) etc. To travel from one country to other is a fundamental freedom restricted however more or less depending about which passport the traveller holds.Visa restrictions play an important role in controlling the movement of foreign nationals across borders. This topic I treated already in my previous article “Visa rank and the western Balkans” and to that I do not have anything new to add now as I do not have any new data available. that Obama is “a lot more capable of analyzing complex issues” and that he would use his term to build relations with European partners and would not ignore the Balkans. that a group of 300 American scientists, historians, sociologists and lawyers will submit a special report on U.S. policies for the Balkans over the last two decades in late January. After hearing which persons Obama has gathered around him I have had and still have some doubts about new Balkans policy of U.S. Persons like Biden, Holbrooke or Kaplan can have long experience, but their actions have been quite anti-Serb and biased. Of course there is change when Bush administration is replaced with ex Clinton cronies – one could predict the second coming of the Clinton Administration. However today I have some optimism related to coming U.S. Balkans policy. I believe that Obama is more analytical person than Bush and he can base his position more to facts than fiction so there is possibility to new pragmatic approach to Balkan problems. Anyway let’s give a change to change. I am a bit worried about a trend at the beginning of year 2009 – a trend I hope will not dominate the rest of the year. The phenomena in my mind is the new tradition of non-negotiation. Crisis management and solving conflicts will be much more harder if local stakeholders are unable even to talk each other. Israel does not negotiate with Hamas so war and human catastrophe will continue before some outsiders are broking s.c. temporary ceasefire or truce while sustainable solution would need long and deep negotiations between local partners. U.S. and Iran are discussing in UN and direct talks we must wait until new President takes his office in White House. Let’s hope that situation does not escalate before that. If real talks had been implemented earlier some today’s problems in Middle East could be now smaller or non-existing. Separatist government in Kosovo province does not want talk with Belgrade authorities about technical details of UN six-point plan from November 2008 before Belgrade recognizes Kosovo; Belgrade will talk with Pristina’s separatist government only when they act under UNMIK (administration of Kosovo international protectorate) umbrella. So many practical problems will not be solved. Russia and Ukraine and EU knew problems with gas deliveries years ago, last October was clear that after New Year deliveries maybe stop – no constructive talks even Xmas-week. When homes in Europe started frozen there seemed to be no hurry to negotiate. When finally EU broke the deal to accept EU monitors to check if Ukraina is stealing gas from pipes or not the last delay was waiting if Ukraina will sign the agreement. Big mess again when leaders are not willing to discuss in due course. It is amazing how on the modern time of information society the authorities are not discussing common problems. Everywhere else the information flow is huge, on-time debate over today’s conflicts is going on around the globe. Some forums are of course for those who in principle are thinking same way over issues but also real unlimited and open forums are available. Internet is full of ideas, arguments, real-time situation information, proposals and solutions. It is sad that when we have all real-time information and modern communication means those who can deside do not bother to have simple old fashion or modern discussions with their colleagues. After years of deadlock year 2008 showed some promising signs of progress with dispute between Moldova and Transdnistria/Pridnestrovie – its separatist region or independent state depending of viewpoint. After a 7-year long pause the leaders of Moldova and Transdnistria met on April 2008, conflict in Georgia launched new process while Russia took a stronger role as mediator. The culmination of year was meeting between President Voronin/Moldova and President Smirnov/Transdnistria on Xmas week. In 1992 Moldova and Transdnistria fought a brief, bitter war which the separatists won, with the assistance of a contingent of locally-based Russian troops left over from the Soviet Red Army. Cease fire left Russian troops in place as peacekeepers and Transdnistria has since then acted de facto as independent – although not recognized – state. Conflict was frozen nearly ten years, then started first serious try to find sustainable solution. In the Spring 2003 Dimitry Kozakin – a special envoy of Russian President Putin – started to broke deal between local stakeholders. His plan known as “Kozak plan” was ready and preliminary agreed to sign on November 2003 but western powers put some pressure towards Moldova and everything was by President Voronin’s rejection. The mediators and observers in the so called “5+2” process – Russia, Ukraine, the OSCE, the EU, and the US – continue to call regularly for resumption of the negotiations. However, a full-scale negotiating round scheduled for October 7-8 in Vienna failed to materialize. Russian Foreign Minister Sergei Lavrov brokered a one on one meeting between Voronin and Smirnov in April 2008; the two had not met in person since August 2001. Shortly after his Sochi conversation with Voronin, Medvedev also received Smirnov. Kozak plan was still on the background but Transdnistria stresses that at present Transdnistria sees the improving of the relations with Moldova within the Treaty “On Friendship and Cooperation between the Republic of Moldova and the Transdnistrian Moldovan Republic” as two international legal entities. The treaty was proposed at the April meeting. As events in Kosovo and Georgia developed in 2008, Moldova took more moderate position as e.g. Georgia. Moldova did not recognize Kosovo, declared itself a neutral country and announced that it had no need to seek NATO membership. Russia from its side has not recognized Transdnistrian independence. Before Xmas meeting President Voronin said that the most essential questions for the present moment were: to resume talks in the 5+2 format, to set in motion the work of the Moldovan and Transdnistrian expert groups and to create proper conditions for a free movement of people, goods and capitals. President Voronin asked his Transdnistrian colleague to set a date for talks in the said format, but Smirnov refused to, saying that there are yet many problems that need to be solved prior to that. In his turn, Vladimir Voronin remarked that the negotiations are necessary for “reintegration and reunification of the country, and this is our chief task“, on which Smirnov agreed that “really, this is your task… As for me, I am fulfilling the will the Transnistrian people spoke out at the 2006 referendum on Transnistria’s independence… We have never been a part of your country“. Transdnistrian leader Smirnov offered Moldovan President Voronin to fix legislatively a status for Russian peacekeepers, who he believes should remain in the conflict zone until the conflict has been finally settled. In western media there has been exaggeration of Russian military presence in Transdnistria. However Russian troops now stationed in the Transdnistrian region (around 1400) is no match in military terms for either the Moldovan or the Transdnistrian armed forces. Including their armies, special forces, militia, interior ministry and security troops, both Chisinau and Tiraspol can muster between 12000 to 18000 men under arms. So Moscow will probably use political not military means for finding solution to this frozen conflict. It will be seen this year if the “Kozak plan” still is valid for further examination, if yes, it will consolidate Moldova’s neutral position as the plan included the change of the Moldovan state’s structure – creation of the federation where Transdnistria and Gagauzia would be granted extensive rights including the right to block the undesirable bills. Moldova will have general elections on Spring 2009 so of course it is possible that the state can take new course e.g. towards Western Powers. In that case Russia might be more inclined to formally recognize Pridnestrovie’s separation from Moldova. You are currently browsing the Conflicts by Ari Rusila blog archives for January, 2009.